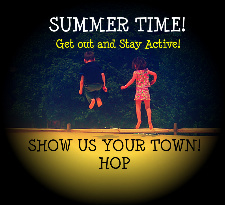 “Show Us Your Town” Hop starts tonight! I’m very excited that starting tonight I will be co-hosting a new linky, “Show Us Your Town” Hop with 3 other awesome bloggers. I was so excited when Michelle from Heartfelt Balance Handmade Life asked me to be one of her co-hosts…it makes me feel like a real blogger! Starting tonight you’ll have the opportunity to Show Us Your Town! Link up all of the cool fun places that you’re visiting in your area. I’ll be showing you some great family spots around the Greater Pittsburgh Area here in the good old state of PA 🙂 Link up as many related posts as you’d like. The hop starts tonight (Friday) at 10 PM EST and runs until Saturday at Midnight. If you link up to the hop we’d appreciate it if you grab our button (in the left sidebar under my blog button) and link back to one of the 4 hosts. Thanks, and I hope to see you back here tonight to link up! *Laughter Really is the Best Medicine by Nicole at I’m Staying Home with My Mom! Please read and comment on their guest posts and then drop by their blogs and say hi! Posted on June 10, 2011, in Blog Hops, Links, Show Us Your Town and tagged blog hop, links, linky. Bookmark the permalink. 3 Comments. Woo Hoo!!! I already have my 2 posts ready to go! But, knowing me, I’ll be in the middle of my own linky! LOL Have a great night Jenn! Just curious how far you are from Wilkes-Barre, PA…..I am a Scent-Sations, Inc distributor and that is where corporate is………. It’s about 5 hours away.